Asuncion (AFP) - A top Venezuelan opposition leader on Monday launched a tour of Latin American countries to rally support for his side in its bid to remove President Nicolas Maduro from office. 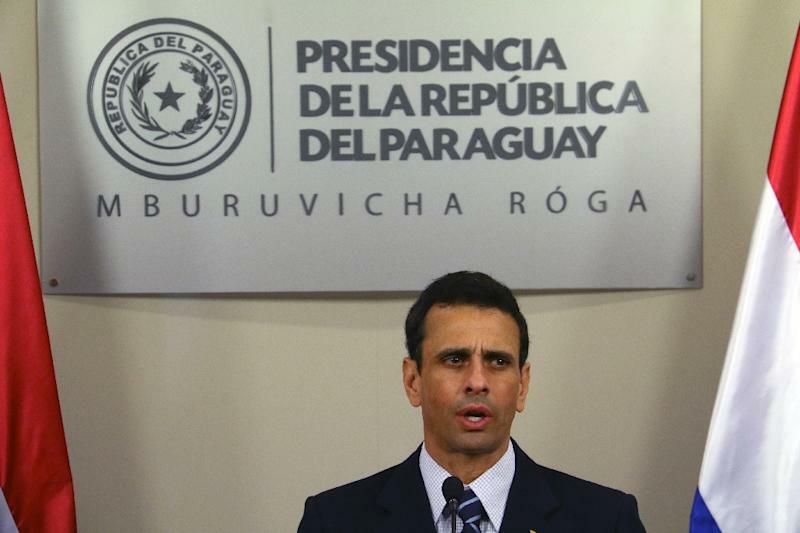 Henrique Capriles, a senior figure in the opposition MUD coalition, was in Paraguay and planned to move on to Argentina and Brazil. "Venezuela is a marvelous country but we need help from all of our brothers in the region for the constitution to be respected," he told reporters. He called on the South American regional blocs UNASUR and MERCOSUR to back his side's constitutional efforts to remove Maduro via a recall referendum. Capriles spoke after meeting with Paraguayan president Horacio Cartes. Capriles was scheduled to meet with Argentina's President Mauricio Macri and Brazil's foreign minister Jose Serra on later steps in his tour. The MUD blames Maduro for a severe economic crisis in Venezuela. Citizens are suffering shortages of basic food and goods. Maduro vows to hold on to power and push on with the "socialist revolution" launched by his late predecessor Hugo Chavez. Center-right leader Capriles lost his bid for the presidency in the 2013 election against Maduro. "The situation in Venezuela is not a matter for indifference," he said. "It can affect what happens in Paraguay and in all the countries in the region. Do not abandon us."